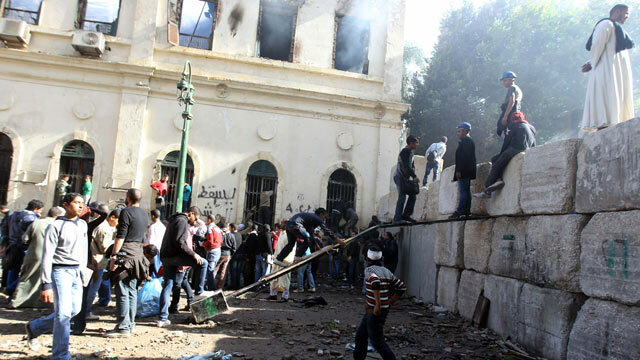 Egyptian protesters climb on a wall to observe the movements of riot police from a higher point during clashes in central Cairo, Dec. 18, 2011. A new Egypt-based terror group has announced itself online with the aim of "fulfilling the oath" of Osama bin Laden, according to jihadi monitors. The group, which calls itself Ansar al Jihad in the Sinai Peninsula, posted its version of a mission statement in online jihadist web forums Tuesday, SITE Intelligence Group said. "With this message we send you the good tidings of the birth of the group 'Ansar al-Jihad in the Sinai Peninsula,' and we pledge unto Allah the Great and Almighty to do our best to fight the corrupt regime and its henchmen among the Jews, the Americans, and those around them," the statement said, according to a report by The Long War Journal. The "regime" the group refers to may be the transitional military government in Egypt. The group pledged an oath to Osama bin Laden, the al Qaeda leader who was killed in May in a special operation in Pakistan by U.S. Navy SEALs, and said that America "nor those who live in America will ever enjoy security as long as we don't live it in reality in Palestine..."
Ansar al Jihad in the Sinai Peninsula reportedly called America the "great enemy of Islam" and blamed Egypt's former president, Hosni Mubarak, for the Egyptian people's suffering. The Egyptian army has been battling so-called al Qaeda-inspired militants in the Sinai Peninsula for months. In August, the military sent a contingent of soldiers into the Sinai Peninsula with the express purpose of rooting out the militants, according to a report by The Associated Press. The overthrow of Mubarak's regime had long been a goal of al Qaeda's, but experts noted that the terror group was relatively silent for weeks at the beginning of the popular revolt there. Then, in February, al Qaeda's then-number two commander, Ayman al-Zawahiri, released an audio message in which he blasted Mubarak and showed his support for the anti-government movement. Zawahiri, who took bin Laden's place as supreme leader of al Qaeda, is Egyptian by birth.